If you fail to adapt your driving style, 4MATIC can neither reduce the risk of accident nor override the laws of physics. 4MATIC cannot take account of road, weather and traffic conditions. 4MATIC is only an aid. You are responsible for the distance to the vehicle in front, for vehicle speed, for braking in good time and for staying in your lane. DSR assists you when driving downhill. It keeps the speed of travel at the speed set on the on-board computer. The steeper the downhill gradient, the greater the DSR braking effect on the vehicle. When driving on flat stretches of road or on an uphill gradient, the DSR braking effect is minimal or nonexistent. 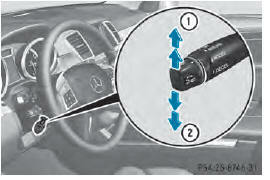 DSR controls the set speed when it is active and the automatic transmission is in the D, R or N position. By accelerating or braking, you can always drive at a higher or a lower speed than that set on the on-board computer. If you fail to adapt your driving style, DSR can neither reduce the risk of accident nor override the laws of physics. DSR cannot take account of road, weather and traffic conditions. DSR is only an aid. You are responsible for the distance to the vehicle in front, for vehicle speed, for braking in good time and for staying in your lane. You are always responsible for keeping control of the vehicle and for assessing whether the downhill gradient can be managed. DSR may not always be able to keep to the set speed, depending on road surface and tire conditions. Select a set speed suitable for the prevailing conditions and when necessary, apply the brakes manually. If the speed driven and the set speed deviate and you activate DSR on a slippery road surface, the wheels may lose traction. If the wheels lose traction. the vehicle can no longer be steered. There is an increased danger of skidding and accidents. Never activate DSR on slippery road surfaces. If you drive faster than the set speed and activate DSR, the vehicle will decelerate on downhill gradients. If you do not know the set speed, the vehicle could decelerate unexpectedly. There is a risk of an accident. Decelerate the vehicle to the set speed before activating DSR. If you do not know what the stored set speed is, store the desired set speed again. 2 DSR indicator lamp X Press button 1. You can only activate DSR when driving at speeds below 25 mph (40 km/h). multifunction display with the Max. Speed 25 mph message (Canada: 40 km/h). symbol and the Not in Drive Program SPORT message then appear in the multifunction display. Indicator lamp 2 goes out. multifunction display with the Off message. The status indicator in the multifunction display goes out. You also hear a warning. On vehicles with the ON&OFFROAD package, if you select a different on-road/off-road program, DSR is also deactivated. ■ To increase or decrease in 1 mph increments (Canada: 1 km/h increments): briefly press the cruise control lever up 1 for a higher set speed or down 2 for a lower set speed. also displayed in status indicator 3. When DSR is activated, you can change the set speed to a value between 1 mph and 11 mph (Canada: between 2 km/h and 18 km/h). The DSR set speed is always changed in 1 mph increments (Canada: 1 km/h increments). This is regardless of whether you press the cruise control lever to or beyond the pressure point. offroad indicator appears in the multifunction display. indicator go out in the multifunction display. The off-road program assists you in driving off-road. The engine’s performance characteristics and the gearshifting characteristics of the automatic transmission are adapted for this purpose. ABS, ESP® and 4ETS programs especially adapted to off-road driving are activated. A gentle accelerator pedal curve is also selected, i.e. the accelerator pedal must be depressed much further in order to accelerate. Do not use the off-road program on roads that are snow-covered or icy or if you have mounted snow chains on your vehicle. The off-road programs assist you in driving off-road. The engine’s performance characteristics and the gearshifting characteristics of the automatic transmission are adapted for this purpose. ABS, ESP® and 4ETS programs especially adapted to off-road driving are activated. An accelerator pedal curve suitable for the terrain is selected, i.e. the accelerator pedal must be depressed further to accelerate. Do not use the off-road programs on roads that are snow-covered or icy or if you have mounted snow chains on your vehicle. For information on driving off-road, see . Off-road indicator 3 appears in the multifunction display. Off-road level 1 is set to +1.2 in (+ 30 mm) above the highway level. If you drive at a speed above 70 mph (110 km/h), off-road program 1 switches to AUTO program. Select off-road program 1 for gentle off-road terrain, e.g. for gravel or sand surfaces or tracks. The engine's torque is restricted to a limited degree and the drive wheels can spin. The spinning wheels produce a cutting effect for better traction. You can only activate off-road program 1 when driving at speeds below 60 mph (100 km/h). The Drive Program OFFROAD 1 Max Speed 60 mph (100 km/h) message appears in the multifunction display. ■ To select: turn selector wheel : until indicator lamp 2 comes on. • Off-road level 1 is set to +2.4 in (+60 mm) above the highway level. • DSR is switched on. • The differential lock is closed. Off-road program 2 automatically switches to off-road program 1 if you drive faster than 30 mph (45 km/h). Select off-road program 2 for rough terrain, e.g. for steep and/or rough terrain or driving on rocky terrain. Your vehicle has an automatically activated differential lock for the transfer case. It controls the balance between the front and rear axles. The differential lock improves the vehicle’s traction. 4ETS controls the balance between both wheels on an axle. You can only activate off-road program 2 when driving at speeds below 25 mph (40 km/h). • if you remove your foot from the accelerator pedal when driving • if off road ABS intervenes when braking If the wheels lose traction. the vehicle can no longer be steered. There is an increased danger of skidding and accidents. 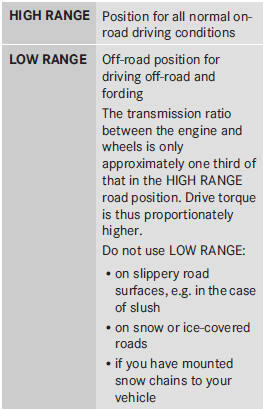 Never select the LOW RANGE off-road gear when driving on slippery road surfaces. If you do not wait for the transfer case gear change process to complete, the transfer case could remain in the neutral position. The power transmission to the driven wheels is then interrupted. There is a danger of the vehicle rolling away unintentionally. There is a risk of an accident. Wait until the transfer case shift process is completed. Do not turn off the engine while changing gear and do not shift the automatic transmission to another position. The LOW RANGE off-road gear assists you in driving off-road and when fording. When LOW RANGE is engaged, the engine’s performance characteristics and the gearshifting characteristics of the automatic transmission are adapted for this purpose. Further information about "Driving off-road" . You will find information about driving safety systems in conjunction with LOW RANGE in the "Safety" section . ■ Press LOW RANGE button 1. When the gear change is complete, indicator lamp 2 lights up. LOW RANGE indicator appears in the multifunction display and in the status indicator. While indicator lamp 2 is flashing, you can cancel the gear change by pressing LOW RANGE button 1 again. 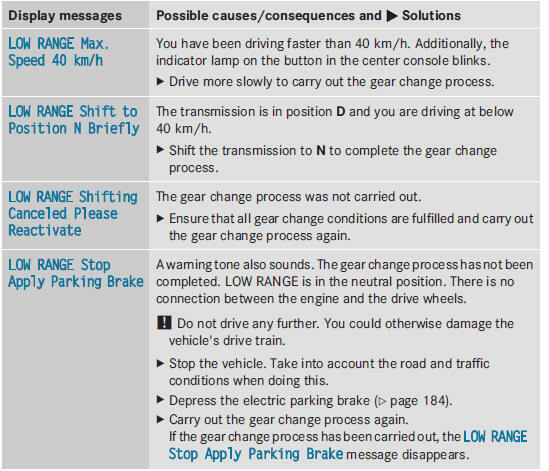 You cannot activate LOW RANGE if the SPORT on-road program is activated. The LOW RANGE Not in Drive Program SPORT message then appears in the multifunction display. When the gear change is complete, indicator lamp 2 goes out. In the multifunction display, the LOW RANGE Off message appears and status indicator 3 goes out. You can display some driving systems, driving programs and additional information in the COMAND display. ■ Make sure that COMAND is activated, see the separate COMAND operating instructions. ■ Press function button :.